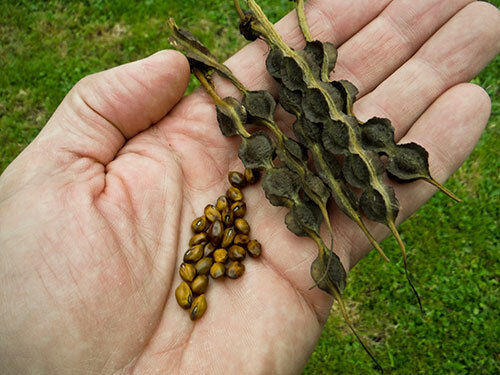 Autumn, like late summer, is a special time of the year for the propagator as this is the time for seed harvesting. This may involve collecting the seeds of annuals for re-sowing, or collecting the seed of perennials or woody plants in order to grow replacement plants. Whatever the purpose of collecting, it is exciting to think you can grow new plants from what is often small seed. There is the added bonus of saving money by growing your own rather than purchasing plants. The only obstacle to this ideal, however, is the seed of many plants has special requirements if it is to germinate successfully – which is where propagation knowledge comes in. In order for plants to reproduce successfully, seed has many built-in mechanisms to control the time of year it germinates. Many plants, for instance, have developed a system to stop their seed (which forms in autumn) germinating until the following spring when conditions are more favourable. As propagators, we need to understand this in order to mimic nature and coax seeds into life. With many seeds, a combination of both stratification and scarification is required to achieve the best results. Stratification – most perennials, like poppies and many hardy trees and shrubs, including most Acers (maples, magnolia, and dogwoods). Scarification – many members of the pea family (k?whai, wisteria, Cercis). Stratification is the process of subjecting seed to cold, moist conditions. In this process, the propagator tries to mimic nature by tricking the seed into experiencing a winter. Typically, seed is collected, cleaned and then stored in a plastic bag of slightly moist medium. It is very important that this medium is not too wet as fungi can form and destroy the seed. Perlite or vermiculite is a good medium to use as they are both relatively sterile and less likely to carry pests and diseases. Once the seed is mixed with the medium and placed in the bag, the bag is sealed with an air space left at the top. The bag can then be stored in the refrigerator at a temperature of between 2°C and 5°C. The contents must not be allowed to freeze. As winter is mimicked, the seeds’ in-built dormancy begins to break. Depending on the plant species, this can take any time between a couple of months and a couple of years to complete. Seed should be checked every week, and the bag given a light shake. The air gap must be maintained. Surprisingly, the seed of many plant species will actually germinate while in the fridge, though other seed will need to be brought out of the fridge to experience warmer temperatures before germinating. Seeds that may take more than one year to germinate should be brought out of the fridge in their bags in spring and kept in a cool, shady spot. They will then need to be returned to the fridge the following autumn to go through the same process they did in their first year after collection. When small seed begins to germinate, sprinkle the contents of the bag onto a seed tray filled with mix, and very lightly cover with compost. Larger seed should be carefully sown into individual pots without causing damage to any emerging roots. Scarification of seed, using a sharp scalpel. Many seeds have such a hard coat that the moisture and air required for germination cannot penetrate them. Scarification involves breaking the hard seed coat surrounding the seed. It can be carried out mechanically, chemically or thermally. mechanical penetration of the seed coat is usually the method of choice for most propagators and it can be carried out very easily on larger seed using a piece of sandpaper. Lightly sand the seed coat until it is to thin, but do not completely break it. This will allow water to slowly seep through. 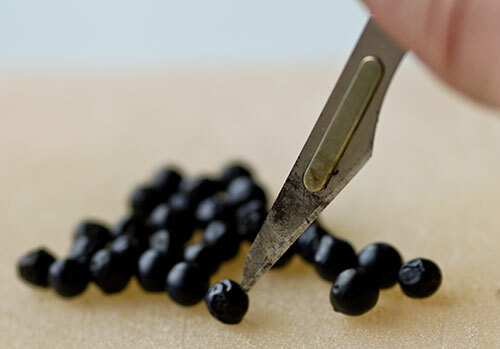 Alternatively, with great care, use a very sharp pointed knife or scalpel to create a very small hole in the seed coat. Thermal scarification involves treating the seed with hot or boiling water for a very short period of time. This softens the seed coat, but great care needs to be taken to ensure the seed does not remain in the hot water for too long, and cook. The last method of scarification is probably the most dangerous as it involves the use of concentrated acid solutions to partially dissolve the seed coat. Chemical scarification is often used commercially for large batches of seed, but timing and concentration is crucial if seed is not to turn to mush. Kõwhai seed ready for treatment.